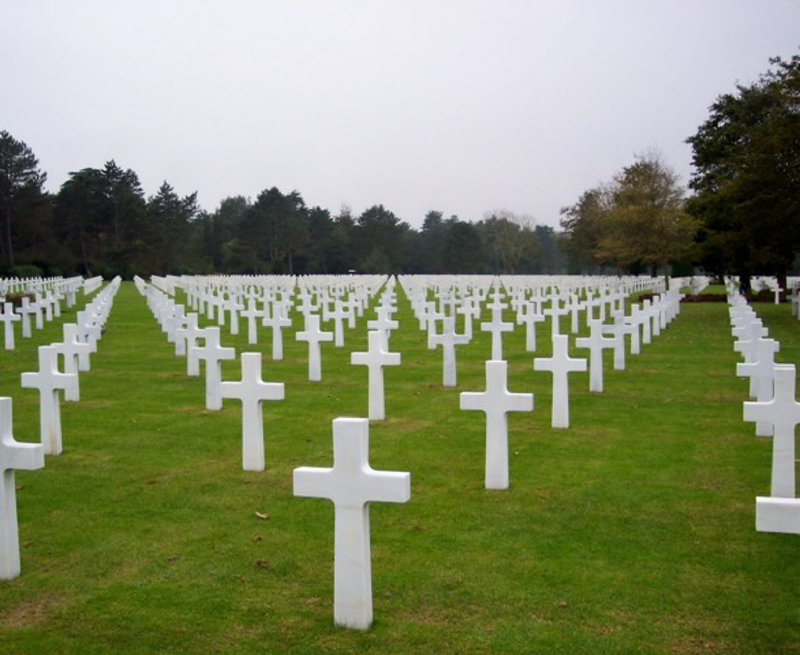 On June 8, 1944, the U.S. First Army established the temporary cemetery, the first American cemetery on European soil in World War II. After the war, the present-day cemetery was established a short distance to the east of the original site. Like all other overseas American cemeteries in France for World War I and II, France has granted the United States a special, perpetual concession to the land occupied by the cemetery, free of any charge or any tax. This cemetery is managed by the American government, under Congressional acts that provide yearly financial support for maintaining them, with most military and civil personnel employed abroad. The U.S. flag flies over these granted soils. The cemetery is located on a bluff overlooking Omaha Beach (one of the landing beaches of the Normandy Invasion) and the English Channel. It covers 172 acres (70 ha), and contains the remains of 9,387 American military dead, most of whom were killed during the invasion of Normandy and ensuing military operations in World War II. Included are graves of Army Air Corps crews shot down over France as early as 1942 and three American women. Only some of the soldiers who died overseas are buried in the overseas American military cemeteries. When it came time for a permanent burial, the next of kin eligible to make decisions were asked if they wanted their loved ones repatriated for permanent burial in the U.S., or interred at the closest overseas cemetery.